* The tool can be used free-of-charge, registration is managed by ERRA, apply here. See what has been done in the resilience assessment projects and case studies you manage! 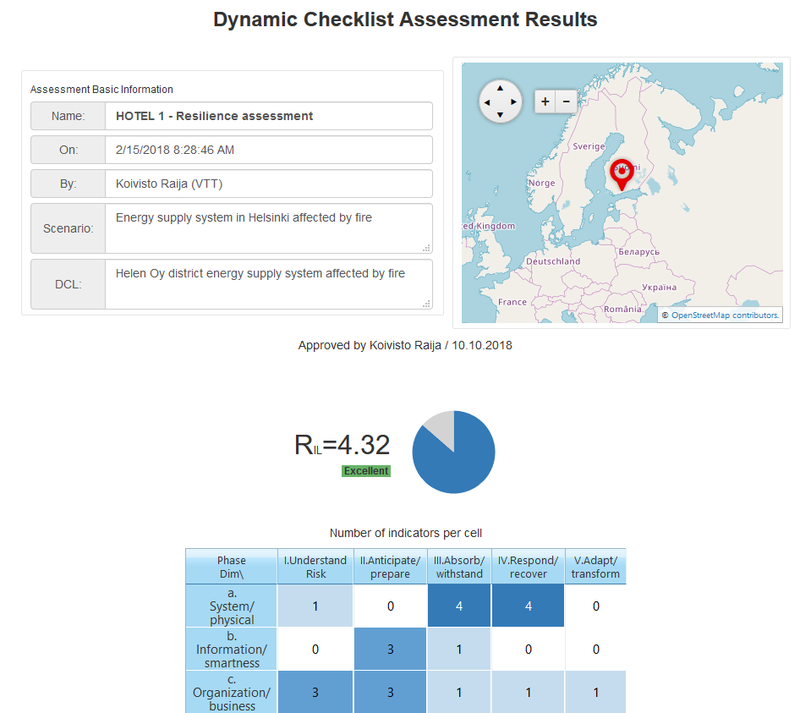 Apply the tool, primarily by filling-in the pre-defined resilience assessment checklists (DCLs) prepared by the experts for assessing resilience of given infrastructures/scenarios. Generate and submit reports! Enter new resilience indicators and issues, create new dynamic lists (DCLs), define scenarios and make new assessments and/or case studies. Manage the exiting case studies, dynamic checklists, issues, indicators... Setup the system! 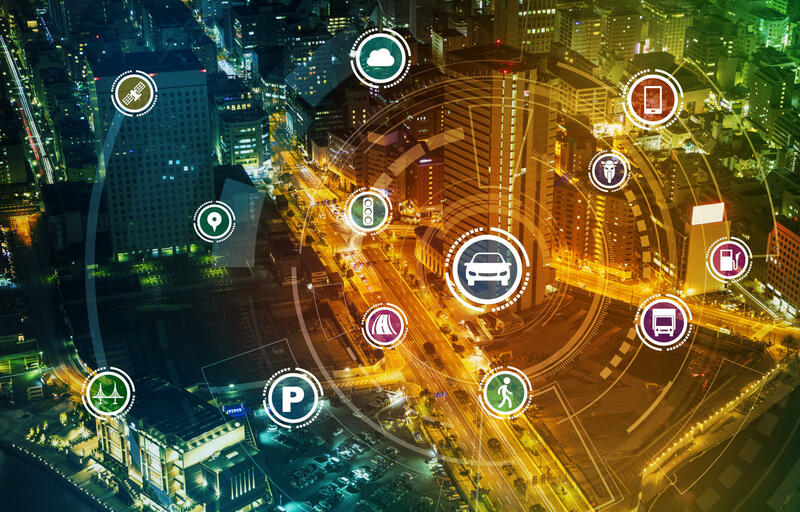 The SmartResilience project provides a new methodology for assessing and managing resilience of critical infrastructures, such as energy and water supply, transportation networks and similar. The term “resilience” of an infrastructure, describes its ability to cope with possible adverse scenarios/events that can potentially lead to significant disruptions in its operation/functionality. Examples of scenarios are, for instance, terrorist attacks stopping airport operation or cyber-attacks destroying the financial systems. Coping with these scenarios means preparing for them, being able to absorb/withstand their impacts, recovering optimally from their impacts and adapting to the continuously changing conditions. In practice, an end-user essentially wants to know answers to those questions and can reach these answers by following the resilience assessment workflow to create their own case study. 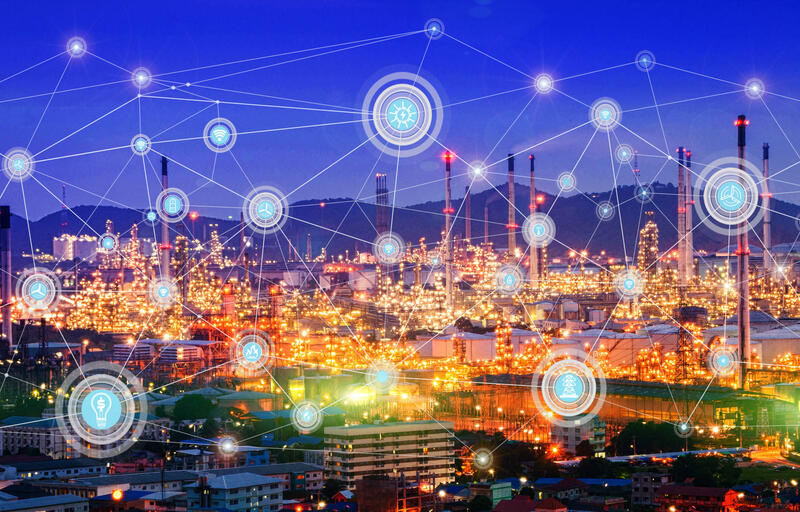 Modern society needs resilience management going beyond conventional risk management, in order to address the behavior of large integrated systems and critical infrastructure, in particular, exposed to possible current and future threats. These are, for instance, terrorist attacks, cyber-attacks or extreme weather disrupting the operation of energy supply, water supply, transportation networks, health care, flood protection, financial sector and other critical infrastructures. The “resilience” of an infrastructure describes in these cases the ability of the infrastructure to successfully cope with these possible adverse scenarios/events, including the capacity to prepare, absorb, withstand, recover and adapt. 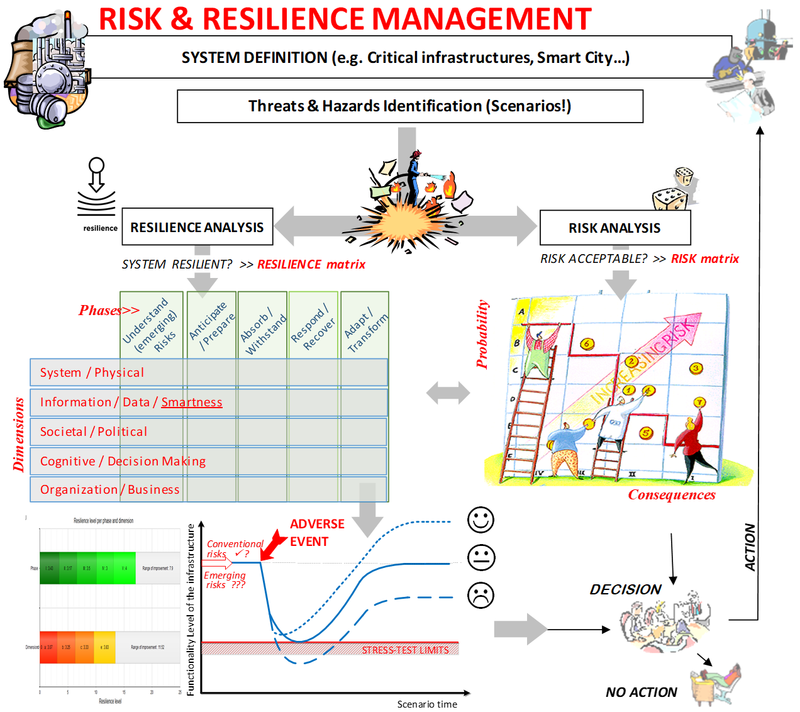 SmartResilience project provides an innovative holistic methodology and the “ResilienceTool” (relying on resilience indicators) for assessing and managing resilience of critical infrastructures. The indicators, in turn, use both conventional and “big” data as the source. The methodology is based on the 55 resilience matrix and the aggregation of the issues and indicators in each cell of the matrix. The phase of “understanding risks”, including the emerging ones, provides the natural link to risk analysis and management. It includes also the modules for optimized decision-making and advanced reporting options compatible with the state-of-the-art approaches (e.g. FEMA). 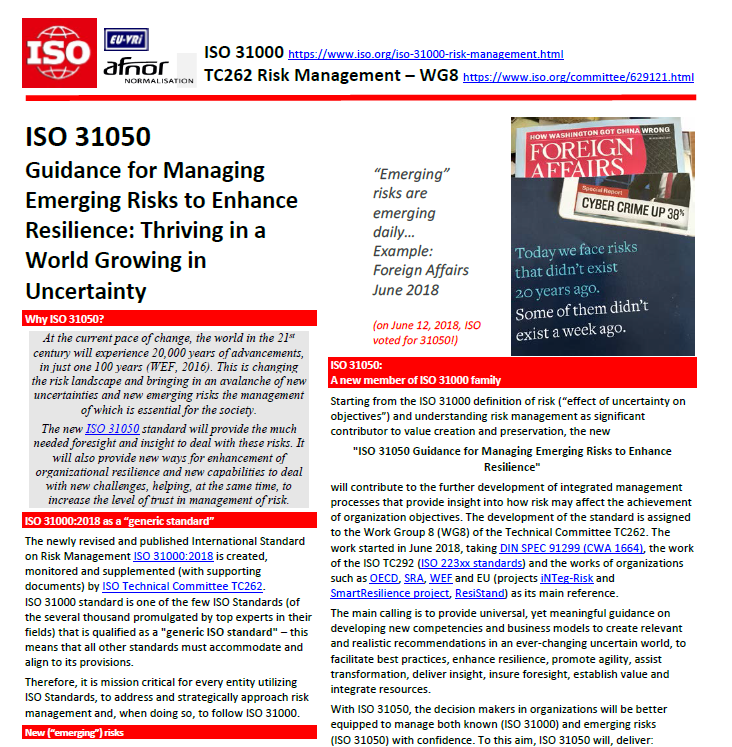 The approach is embedded into the new ISO 31050 standard (under development). How to assess and monitor resilience level of a critical infrastructure? SmartResilience looks at resilience indicators to show how an infrastructure is prepared for an adverse event, how can it withstand it and then recover, possibly adapting afterwards. The assessment result is the “Resilience Level” (a number) that allows to compare one infrastructure with other infrastructures (do the “benchmarking”) and/or to monitor changes in resilience over the operation time. This part of the assessment normally does not concern any particular scenario, but covers issues and indicators applicable in general. 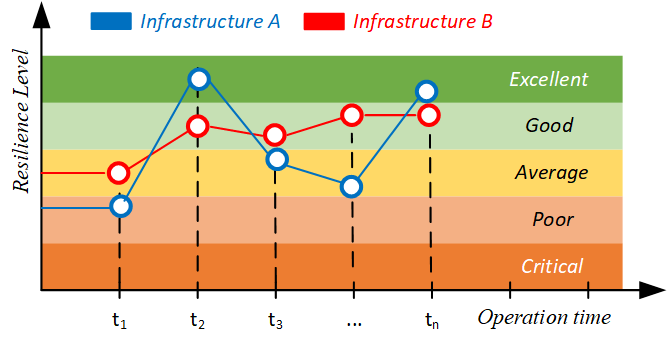 The resilience level can be monitored in time and/or compared among different infrastructures. Assess possible outcomes of an adverse event/scenario? SmartResilience looks at the functionality of an infrastructure (e.g. does the energy plant produce electricity, can passengers be transported, etc.) by considering indicators showing the status of single “elements” of functionality of the infrastructure. The assessment is based on resilience indicators during the course of the adverse/disruptive event (“scenario time”). The result is a prediction of the functionality of the infrastructure after the event (e.g., “as before”, “better”, “worse” or “lost”). Will the functionality remain in the prescribed limits? 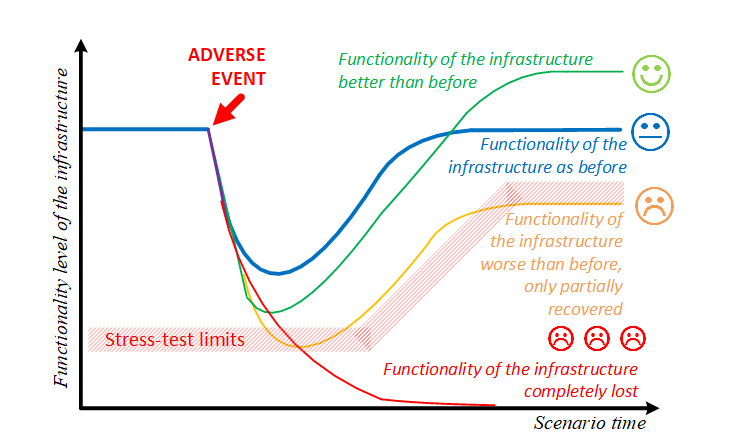 The same type of the assessment can be done in order to check if the behavior of the infrastructure is within the prescribed limits, e.g. the loss of function smaller than the maximum allowed, e.g. 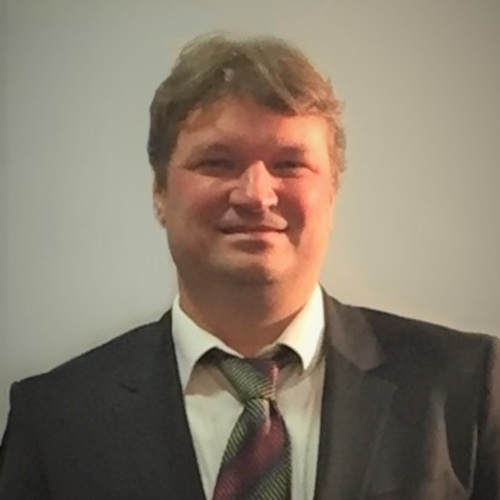 following the European Nuclear Safety Regulators Group stress-test definition. How an adverse event at one infrastructure impacts / may impact the operation of other infrastructure? 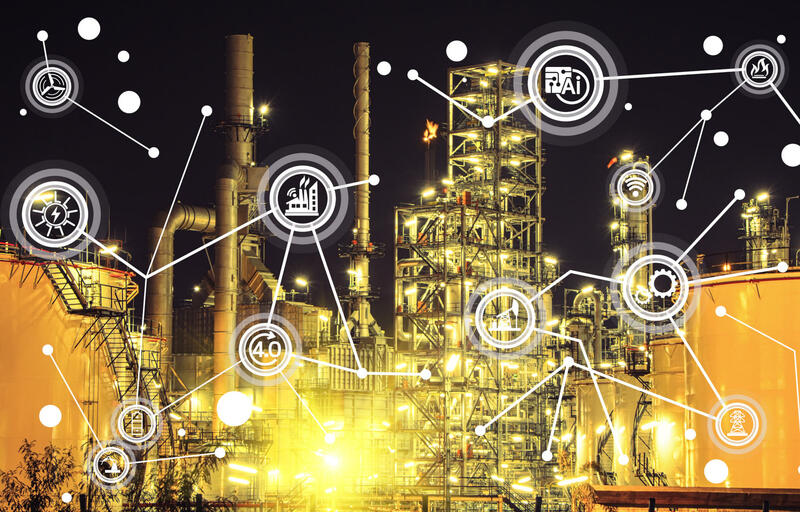 SmartResilience looks at interdependencies between infrastructures to understand how, in a case of a problem on one of them, the functionality of others can be impacted. 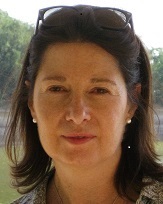 The assessment is based on issues and indicators: these issues and indicators that are shared by different infrastructures indicate “lines of interconnectedness and interdependency”. The infrastructures involved and the issues/indicators form thus the logical network that can analyze in order to model the propagation of influences from one infrastructure to another. 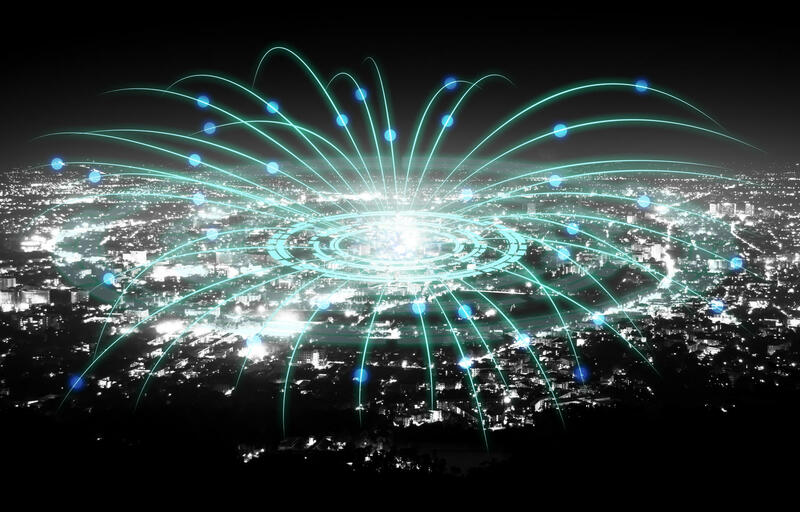 Thus, the cascading and ripple effects can be modelled and the dynamic behavior of the network (“infrastructure-of-infrastructures”) analyzed. E.g. How to get the best return-on-investment in resilience enhancement? 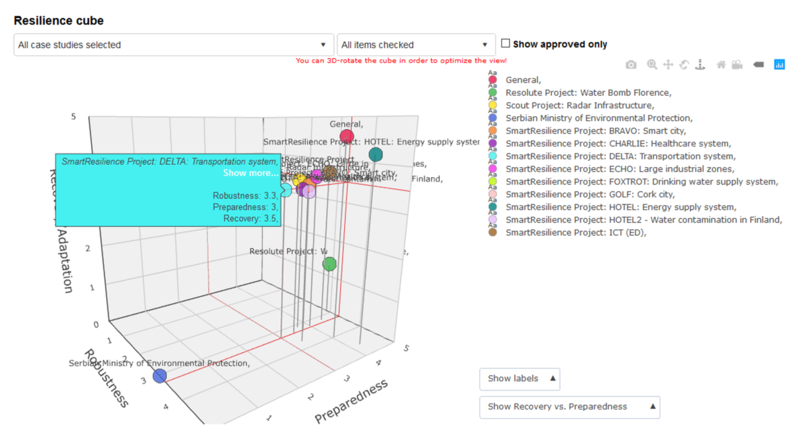 The SmartResilience tool provides the option to optimize the resilience decision-making: e.g. 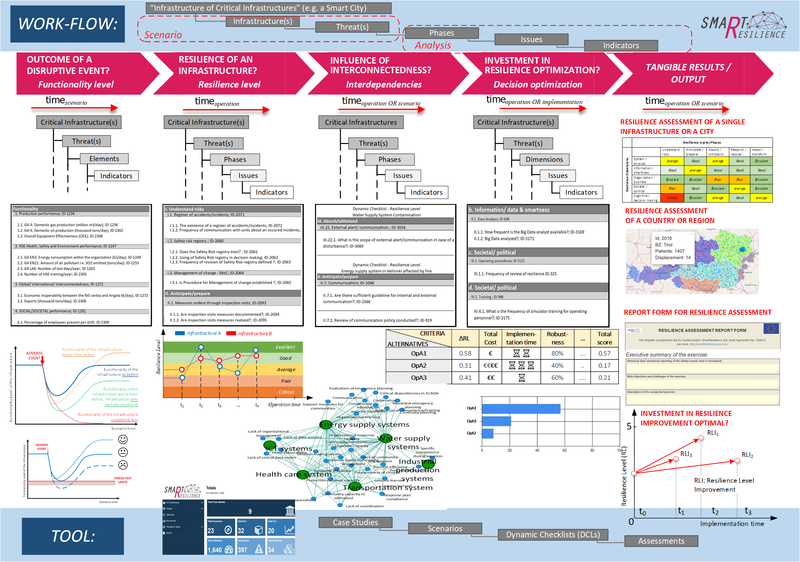 for the case when various “resilience improvement portfolios” (the optimization alternatives “OpAs” in the figure! ), are considered. Different criteria can be taken into account (e.g. implementation time, cost, robustness improvement…), but the main one is the Resilience Level Improvement (RLI). 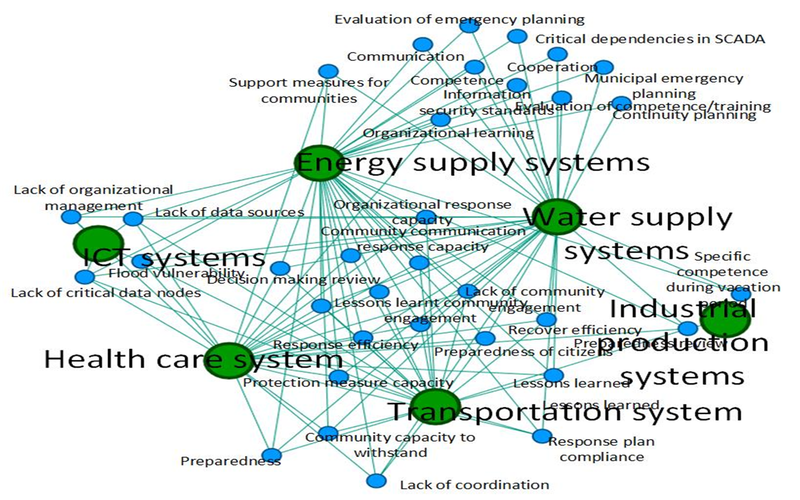 No matter how complex the resilience analysis of complex infrastructure is or could be, the intuitively understandable and explicit visualization is a necessary pre-condition for practical application of the SmartResilience methodology (“All victims are accounted for”!). 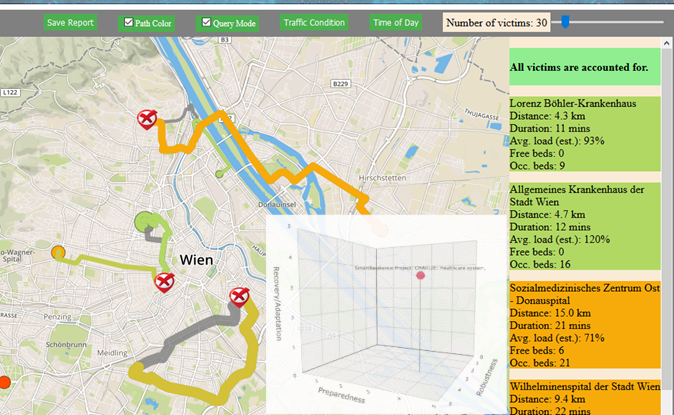 The ResilienceTool puts, therefore, a lot of emphasis onto visualization which covers several aspects: contents of the resilience indicator database (3,500+ indicators), visualizing the indicator values in different scenarios (D3-based visualization), providing overview of the work done on multiple infrastructures (incl. benchmarking), indicator mapping, GIS (geographic information system) for resilience mapping, or the visualization in terms of business intelligence (BI). The key innovative element in the ResilienceTool is the “Resilience Cube” – the “trade mark” of the SmartResilience project. Although a significant amount of high-level expertise, often by experts from different domains, is usually needed for resilience assessment of complex systems and infrastructures, there are tasks (parts of the overall analysis) requiring simplicity and straightforwardness. This applies in particular for the (a) inputs of values and (b) reporting the results. The main calling of ISO 31050, into which the methodology of SmartResilience is embedded, is to provide universal, yet meaningful guidance on developing new competencies and business models to create relevant and realistic recommendations in an ever-changing uncertain world. These recommendations should facilitate best practices, enhance resilience, promote agility, assist transformation, deliver insight, insure foresight, establish value and integrate resources – also for enhancing resilience, also the resilience of critical infrastructures. To this aim, ISO 31050 will, deliver structured context (e.g. definitions, drivers, metrics, …), the management framework, guidance for interoperability and common/agreed indicators, as well as the particular considerations related to emerging risks in resilience assessment. The SmartResilience results and the ResilienceTool are envisaged to stay available, free of charge for the registered ERRA members, also after the project end. 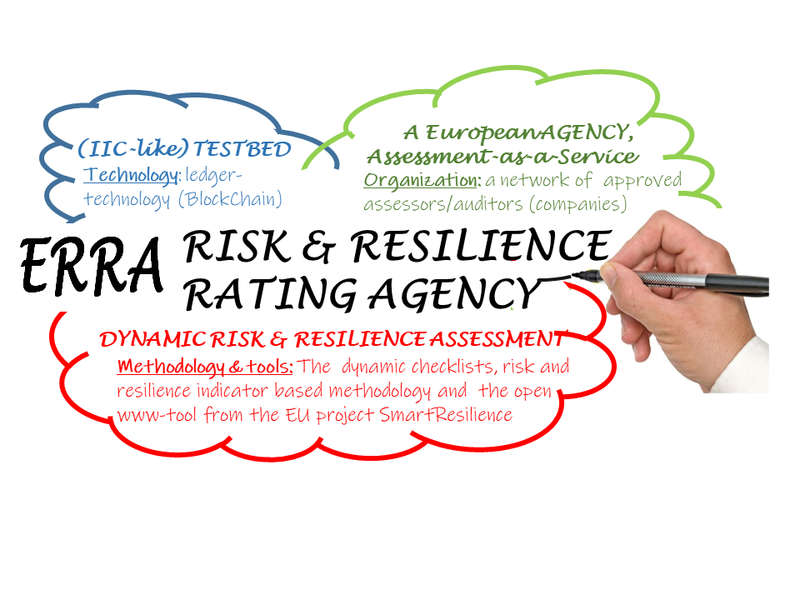 The main ERRA service (risk and resilience “Assessment-as-a-service”) will be performed by the Agency together with and subcontracting by Agency member organizations (organizational members AND individuals) which have the different competencies needed to meet the specific needs of specific industry branches or application areas (e.g. critical infrastructures or new technologies). 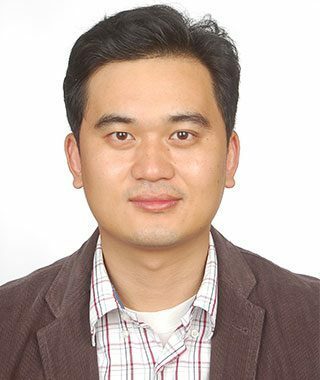 In the most general terms, ERRA would contact and negotiate with the customers, engage the experts among the Agency members, process the contracts with the customer, and guarantee the quality of assessment provided by the Agency. Main Agency services would be the self-assessment, the audited self-assessment and the 3rd party audit, similarly to the services of GRI (www.globalreporting.org). "We were pleased to see the progress made in the development of the indicator-based resilience assessment tool and its possibilities. We will seriously consider application of the tool in our future work, especially in the area of risk assessment and scenario development, measuring the resilience of critical infrastructure systems as well as training and exercise. 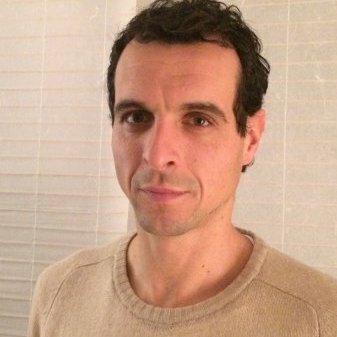 We are looking forward to further strengthen our collaboration." "By applying the SmartResilience methodology and tools we were able to significantly improve our company's current risk and resilience management practices." "The IRGC works to better analyse the relations between insurance, resilience and outcome of SmartResilience. The insurance sector is interested in approaches and tools for the measuring the resilience of critical infrastructures and their interconnectedness in case of disruption, which is precisely what SmartResilience is doing"
"The SmartResilience tool made it possible to assess resilience of different systems and sectors using a standardized methodology and criteria, which is very valuable for infrastructure safety management." 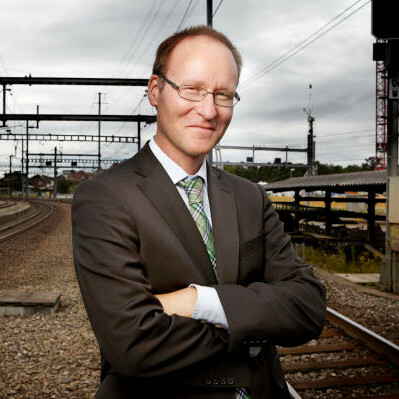 "The SmartResilience approach and tool offer advantages for the quantitative assessment and management of systemic risks and resilience of critical infrastructures." 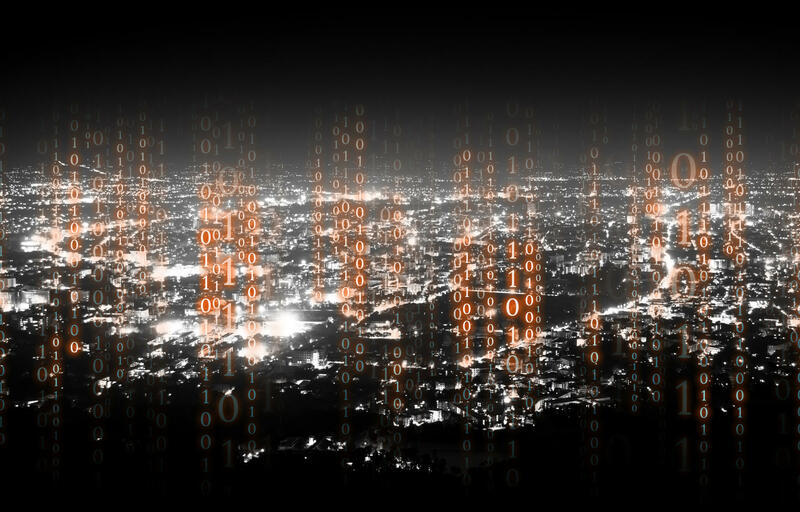 "Smart cities will need smarter resilience management and full-scale exploited of big data - all the issues dealt with by both our "Digital Agency" (of city of Heidelberg) and the SmartResilience project."